Dense, diverse neighborhoods encourage walking, bicycling and transit. The choice of a site was very important to the Bullitt Center team. The success of the project relies on its position and relationship to the dense urban fabric of Capitol Hill, the Central Area and Seattle overall. 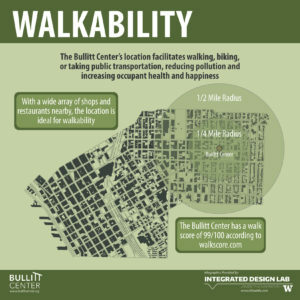 The goal was to select a central location that would make the Bullitt Center conveniently accessible by foot, bike, and public transportation. The lack of onsite parking for single-occupancy vehicles made the site selection even more important. The Bullitt Center is lucky to be at a center of a growing public transportation network. More than 20 bus routes cross within a half mile of the building, connecting to neighborhoods throughout the greater Seattle area. By the standards of US cities, the Bullitt Center is well-situated to encourage bicycling, with bike lanes and a new cycle track in the area. And with a wide array of shops and restaurants, engaging architecture, close access to downtown Seattle and many other amenities, the neighborhood is ideal for walking. Onsite, bike parking, showers, and locker rooms integrated into the restrooms on each floor support modes of active transportation. In 2014, a new streetcar line will open near the Bullitt Center, providing new transit connections to downtown. In 2016, the Capitol Hill lightrail station will open, connecting the neighborhood South to downtown, the Rainier Valley and Seatac Airport, and North to the University of Washington. 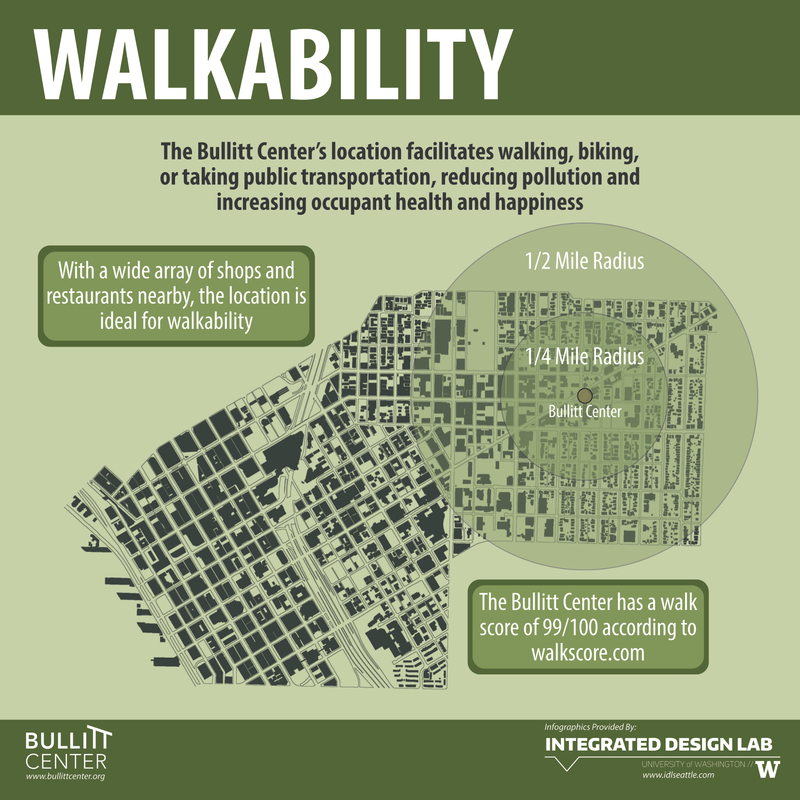 In short, walking, biking and transit around the Bullitt Center will continue to improve over the next few years.